If you cast your minds way back, some of you may remember the galley/ shop in Clerkenwell know as Best. Niki opened Best back in 2004 and it housed the best of everything; the best in design, art, clothing and books. The gallery in it's day, hosted some fantastic exhibitions featuring the likes of Mike Giant, Dalek, INSA, ASTEK, Danny Sangra, Pinky and Matt Sewell, lots of good times! When her gallery closed she took time out to relocate to Brighton, recuperate, and raise her son. Always ahead of the game, she was promoting and collecting the work of up-coming artists when some of them were barely out of nappies themselves. Her eye for vibrant, relevant talent has been proved again and again by the quality of the commissions and reputation that many of them have continued to make. We bumped into Niki recently at the preview of the Dalek Delta show at Elms Lester (blogged)and have just spotted she has updated her blog with news of a "soft" launch of their online shop. The shop features a selection of classic Limited Edition screenprints for sale from Best's archive, some dating back to 2002! 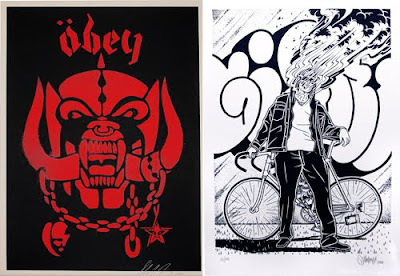 Prints from Mike Giant, Obey and Frank Kozik (all pictured) as well as works from Pinky and Claire Skully are now available from the online shop. Go check the other prints on sale and be sure and bookmark the site as this is the soft launch! !